Recolour, resize and print the digital papers. Create the green card base. Use a border punch to create edging on the blue paper, then stitch to the card base. Stamp the sentiment with black ink. Shadow stamp, sponge green ink onto the tree leaves, and colour the trunks with Copic marker. Cut out and paper piece the trees and house, adhering to the card with dimensional adhesive. Try sponging ink onto your stamped image to achieve a different coloring effect. 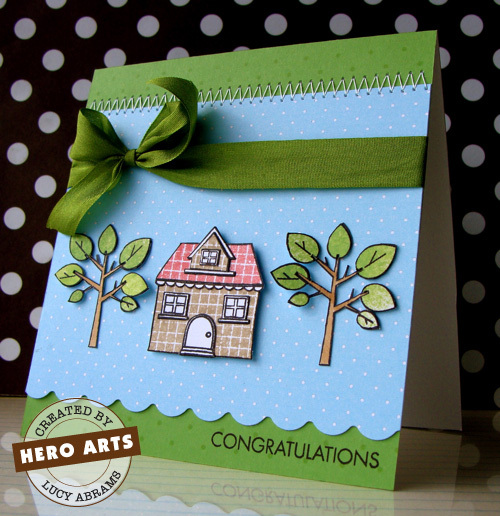 Hero Arts Silky Stamping Sponges are perfect for this.